This Web page offers you an overview of all museums in Schleswig-Holstein, their manifold characteristic treasures and their current activities. 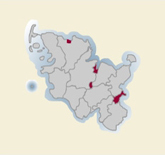 Find information on individual museums in Schleswig-Holstein. Different categories make your search easier. A calendar of events informs you about current exhibitions and activities in our museums. Look up information on the manifold museum objects in Schleswig-Holstein that have been registered within the DigiCult project. On Sunday, the 12th May 2013 Museums all over Germany celebrate International Museum Day. This year's Theme is 'Memory + Creativity = Social Change'. What is International Museum Day? Find more information on on the homepage of International Council of Museums (ICOM), who established IMD in 1977 to encourage public awareness of the role of museums in the development of society. If you need any help or information please click here or ask one of our contacts listed in the imprint.